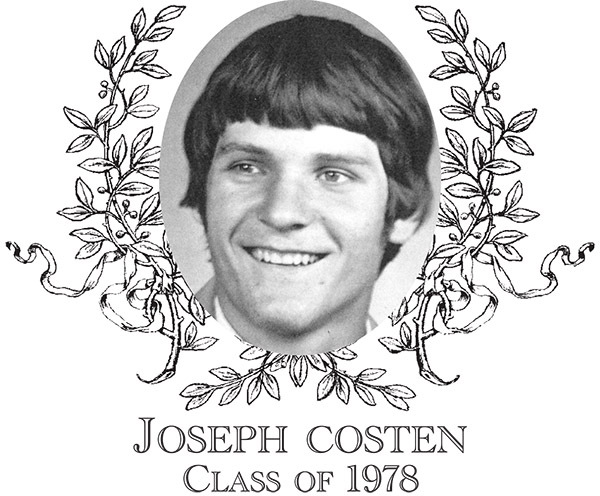 Joseph Costen, Class of 1978, was a three-sport athlete playing football, basketball, and golf. Joe started his athletic career as both an offensive and defensive player on the gridiron and continued to do so for the next four years. He was not only an impact player on both sides of the ball, but was the team's placekicker, earning the nickname of "Joe-Toe." This made Joe the go-to person in close games to give the team the lead. Joe was named a Border Conference All-Star his junior year. Joe excelled on the field in his senior year earning him awards both offensively and defensively. Joe was the leading scorer and was named Outstanding Defense Back of the Year and MVP. Joe continued his career on the basketball court. In his junior year, he was the leading scorer averaging 14 points per game. In his senior year, he was named the Most Improved Player, averaging 16 points and 12 rebounds per game. Joe's determination at both ends of the court were rewarded by being named to the Telegram & Gazette All-Star Team. The most memorable moment of Joe's career was the 1977 Clark Tournament semi-final game. The game was tied against rival Shepherd Hill with 13 seconds left in the game. As the ball made its way down the court, Joe received the ball at the baseline and heard someone in the stands yell "shoot!" He turned and released a buzzer beating jump shot for the Bartlett win. Joe rounded out his athletic career playing golf all four years for the Indians. He was named Most Improved Player in his sophomore year and Captain of the team his junior and senior years. Beyond the fields of Bartlett High School, Joe remained active in Webster sports. He played on the Webster Men's Football and Softball teams and was also a Massachusetts Junior State Bowling Championship. Joe passed away in 1996 and is survived by his wife Teri, who resides in Dudley, and their three children Shaun, Megan, and Rebecca.